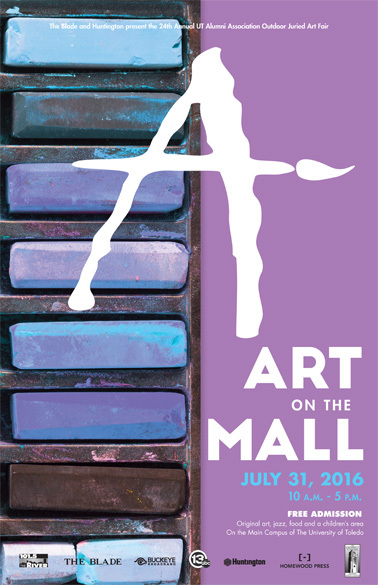 The 24th annual Art on the Mall will take place Sunday, July 31, from 10 a.m. to 5 p.m. on Centennial Mall. Art on the Mall is a juried art show that will have more than 100 booths featuring mediums such as acrylic, glass, jewelry, watercolor, woodwork, photography, oil, mixed media and more. Each booth will have artwork available for sale by cash or credit. There will be free parking in Lot 1 South, Lot 1 North and Lot 13, as well as free admission and golf cart shuttles to and from Centennial Mall. The artists’ work will be juried by representatives from the Dayton Art Institute. Prizes will be given to the top artists, and UT’s Best of Show award will be presented to an artist who is affiliated with the University. “The quality of our artists’ work is outstanding, and there is something for everyone. We have a diverse and eclectic mix sure to excite art lovers of all kinds,” said Ansley Abrams-Frederick, director of alumni programming in the UT Office of Alumni Relations. Food and beverages will be for sale from Karen Anne’s Kettle Corn, Opa! Gyros, Java Sensations, K & K Concessions, Jeanie’s Weenies and Let’s Go Nuts. There also will be a children’s area where young artists can make their own creations, as well as a beer garden for attendees 21 and older. Music will be peformed by UT student groups, Minor Frett and The Cosmonauts throughout the day. Art on The Mall is sponsored by The Blade, Huntington, 13ABC, Buckeye Broadband, 101.5 The River and Homewood Press. For more information, contact Abrams-Frederick at 419.530.4316 or ansley.abrams@utoledo.edu. This entry was posted on Monday, July 18th, 2016 at 3:54 am and is filed under Alumni, Arts, Events, UToday .